I am Robin Theobald and I was born in London in March 1948. I took up art as a preference (over chemistry) when attending Christ’s College, Grammar School, Finchley, North London.. I had always been enthralled with paintings exhibited near Hampstead Heath which drove me, even from an earlier age, to paint. During the 80’s I lived in Fareham, Hampshire and joined the art society within that town which gave me further insight and an opportunity to display and sell my work at the local library. Since that time I have been painting on and off for many years and my wife and I currently live in Clifton Village (near Preston), Lancs. where we have been now for over 20 years. Since 2011 I have been able to display my work through Prom Art at Grange-over-Sands, Cumbria and I have become a member of the Lytham St. Annes Art Society. 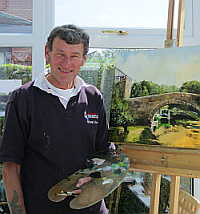 I always work in oils on canvas, mostly landscapes, taking inspiration from places I have visited. I have also had a number of commissions to produce pet portraits. Copyright@2018-2019 - robinspaintings.co.uk. All right reserved.